Shop for authentic Kentucky Flags. We offer indoor and outdoor Kentucky flags in durable nylon. Our outdoor flags are finished with a canvas heading, while indoor flags are finished with a lined pole hem and your choice of with or without fringe. We also offer indoor and outdoor Kentucky flag sets. 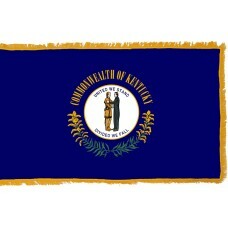 The Kentucky State Flag features a dark blue field with the seal of Kentucky in the center of it and the words "The Commonwealth of Kentucky" around it as well as wreaths of "goldenrod." The seal of Kentucky features a pioneer and a statesman embracing with the state motto "United we stand, divided we fall" around them. It is thought that the pioneer in the seal of Kentucky is Daniel Boone, who explored and settled some of Kentucky, and the statesman on the right is Henry Clay, who was one of the most famous statesmen in Kentucky. The wreaths of Goldenrod are Kentucky's state flower. 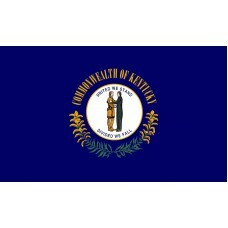 The Kentucky state flag was adopted on March 26th, 1918. Kentucky (officially known as the "Commonwealth of Kentucky"), is a state that is located in the East South-Central region of the United States of America. It shares borders with West Virginia, Virginia, Tennessee, Missouri, Illinois, Indiana, and Ohio. The capital city of Kentucky is called Frankfort. Kentucky falls within three major geographical regions of the United States of America which are, Appalachian Highlands, the Interior Lowlands, and the Coastal Plain. Kentucky is also referred to as "The Bluegrass State," due to the bluegrass that has been found in a lot of its pastures. It is thought that Kentucky was originally inhabited by indigenous agricultural and hunting people. Other native American tribes that soon began to inhabit the area included, the Shawnee, Cherokee, and Delaware. It was always difficult for people and explorers to reach the area of Kentucky due to the difficulty they faced crossing the Appalachian Mountains. In 1750, British explorer, Thomas Walker, discovered a pass through the mountains (known as the Cumberland Gap). Following the French and Indian War in 1783, the British promised the Indians that they would not attempt to settle the area of Kentucky passed the mountains, however, they gradually began to settle. The First permanent European settlement was established by James Harrods in 1774 and was known as "Harrdosburg." More Europeans began to settle here, and due to the fact that they were building homes on hunting grounds, this caused a lot of conflict with the Shawnee tribe who opposed it. In 1774, Lord Dunmore (the governor of Virginia) declared a war on the Shawnee tribe and defeated them at the "Battle of Point Pleasant" and the Shawnee tribe and the settlers of Kentucky agreed to use the Ohio River as a border. In 1775, Daniel Boone and his settlers established the town of "Boonesborough" as well as expanding the "Cumberland Gap" enabling wagons to travel through there. The new trail became known as "The Wilderness Road." After the American Revolutionary War, Kentucky became a part of Virginia until it applied for its own statehood and on June 1st, 1792, Kentucky became the 15th official state of the United States of America.